The United Kingdom of Great Britain that came into being on 1 May 1707 was the political union of the Kingdom of England (which included Wales ) and the Kingdom of Scotland. The terms of the union had been agreed in the Treaty of Union that was negotiated the previous year and then ratified by the parliaments of Scotland and England each approving Acts of Union. As well as being a political union, the United Kingdom was designed to be a full economic union with the majority of the 25 Articles of the Treaty of Union dealing with economic arrangements for the new state. Over the next three centuries, the United Kingdom developed as one of the world's leading economies, a position it retains today. The basis of the British Empire was founded in the age of mercantilism, an economic theory that stressed maximizing the trade inside the empire, and trying to weaken rival empires. The modern British Empire was based upon the preceding English Empire which first took shape in the early 17th century, with the English settlement of the eastern colonies of North America, which would later become the original United States , as well as Canada 's Maritime provinces, and the colonizations of the smaller islands of the Caribbean such as Trinidad and Tobago , the Bahamas , the Leeward Islands, Barbados , and Jamaica . These sugar plantation islands, where slavery became the basis of the economy, were part of Britain's most important and successful colonies. The American colonies also utilized slave labor in the farming of tobacco, cotton, and rice in the south. Naval material and furs in the north were less financially successful, but had large areas of good agricultural land and attracted far larger numbers of British immigrants who would also utilize slave labor to farm agricultural commodities. Britain's American empire was slowly expanded by war and colonization. Victory over the French during the Seven Years' War gave Britain control over almost all of North America. In a period loosely dated from the 1770s to the 1820s, Britain experienced an accelerated process of economic change that transformed a largely agrarian economy into the world's first industrial economy. This phenomenon is known as the "industrial revolution", since the changes were all embracing and permanent. It has been argued by historians such as Christopher Hill, Eric Hobsbawm, and E.P. Thompson that the foundations of this process of change can be traced back to the Puritan Revolution in the Seventeenth Century. This produced landed and merchant elites alive to the benefits of economic change, and a system of agriculture able to produce increasingly cheap food supplies. To this must be added the influence of religious nonconformity, which increased literacy and inculcated a 'Protestant work ethic' amongst skilled artisans. A long run of good harvests, starting in the first half of the eighteenth century, resulted in an increase in disposable income and a consequent rising demand for manufactured goods, particularly textiles. The invention of the flying shuttle by John Kay enabled wider cloth to be woven faster, but also created a demand for yarn that could not be fulfilled. Thus, the major technological advances associated with the industrial revolution were concerned with spinning. James Hargreaves created the Spinning Jenny, a device that could perform the work of a number of spinning wheels. However while this invention could be operated by hand, the water frame, invented by Richard Arkwright, could be powered by a water wheel. Indeed, Arkwright is credited with the widespread introduction of the factory system in Britain, and is the first example of the successful mill owner and industrialist in British history. The water frame was, however, soon supplanted by the spinning mule (a cross between a water frame and a jenny) invented by Samuel Crompton. Mules were later constructed in iron by Messrs. Horrocks of Stockport. As they were water powered, the first mills were constructed in rural locations by streams or rivers. Workers villages were created around them. Styal Mill (owned by the National Trust) is a surviving example of this kind of enterprise, as is New Lanark Mills in Scotland. These spinning mills resulted in the decline of the domestic system, in which spinning was undertaken in rural cottages. However, the textile trade was transformed, as was much else, by the development of the steam engine. The first practicable steam engine was invented by Thomas Newcomen, and was used for pumping water out of mines. It was perfected by James Watt, being transformed into a reciprocating engine capable of powering machinery. The first steam-driven textile mills began to appear in the last quarter of the eighteenth century, and this transformed the industrial revolution into an urban phenomenon, greatly contributing to the appearance and rapid growth of industrial towns. The progress of the textile trade soon outstripped the original supplies of raw materials. By the turn of the century, imported American cotton had replaced wool in the North West of England, though the latter remained the chief textile in Yorkshire . Textiles have been identified as the catalyst in technological change in this period. The application of steam power stimulated the growth of the coal industry, the construction of mills and the demand for machinery and engines impacted upon the iron industry, and the demand for imported raw materials (and later improved means of export and distribution) led to the growth of the canal system, and later the invention and spread of the railway. Such an unprecedented degree of economic growth could not be sustained by domestic demand. The application of technology and the factory system created such levels of mass production and cost efficiency that enabled Britain to undercut foreign competitors. The political dominance created by the growth of an overseas empire and the strategic control of the world's seas by the Royal Navy, enabled British manufacturers to export their goods to Europe, Africa, Asia, and Latin America. Indeed, the demands of the war economy created by the French and Napoleonic Wars added to these opportunities. Walt Rostow has posited the 1790s as the take-off period for the industrial revolution. This means that a process previously responding to domestic and other external stimuli began to feed upon it, and became an unstoppable and irreversible process of sustained industrial and technological expansion. In the late eighteenth and early nineteenth century a series of technological advances led to the Industrial Revolution. Britain's position as the world's pre-eminent trader helped fund research and experimentation. The nation was also gifted by some of the world's greatest reserves of coal, the main fuel of the new revolution. It was also fuelled by a rejection of mercantilism in favour of the predominance of Adam Smith's capitalism. The fight against Mercantilism was led by a number of liberal thinkers, such as Richard Cobden, Joseph Hume, Francis Place and John Roebuck. Some have stressed the importance of natural or financial resources that Britain received from its many overseas colonies or that profits from the British slave trade between Africa and the Caribbean helped fuel industrial investment. It has been pointed out, however, that slave trade and the West Indian plantations provided less than 5% of the British national income during the years of the Industrial Revolution. 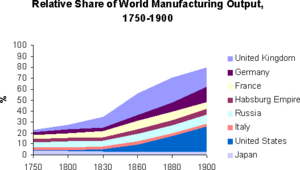 The Industrial Revolution saw a rapid transformation in the British economy and society. Previously large industries had to be near forests or rivers for power. The use of coal-fuelled engines allowed them to be placed in large urban centres. These new factories proved far more efficient at producing goods than the cottage industry of a previous era. These manufactured goods were sold around the world, and raw materials and luxury goods were imported to Britain. During the Industrial Revolution the empire became less important and less well-regarded. The British defeat in the American War of Independence (1775-1783) deprived it of one of its most populous colonies. This loss of the southern American colonies was coupled with a realisation that colonies were not particularly economically beneficial. It was realised that the costs of occupation of colonies often exceeded the financial return to the taxpayer. In other words, formal empire afforded no great economic benefit when trade would continue whether the overseas political entities were nominally sovereign or not. The American Revolution helped demonstrate this by showing that Britain could still control trade with the colonies without having to pay for their defence and governance. Capitalism encouraged the British to grant their colonies self-government. The end of the old colonial system was most evident in the repeal of the Corn Laws, the agricultural subsidies on colonial grain. The end of these laws opened the British market to unfettered competition, grain prices fell, and food became more plentiful. The repeal greatly injured Canada , however, whose grain exports lost a great deal of their profitability. Some argue that this push for free trade was merely because of Britain economic position and was unconnected with any true philosophic dedication to free trade. Roughly between the Congress of Vienna and the Franco-Prussian War, Britain reaped the benefits of being the world's sole modern, industrialised nation. Following the defeat of Napoleon, Britain was the 'workshop of the world', meaning that its finished goods were produced so efficiently and cheaply that they could often undersell comparable, locally manufactured goods in almost any other market. If political conditions in particular overseas markets were stable enough, Britain could dominate its economy through free trade alone without having to resort to formal rule or mercantilism. Britain was even supplying half the needs in manufactured goods of such nations as Germany , France , Belgium , and the United States . Britain, in this sense, continued to adhere to the Cobdenite notion that informal colonialism was preferable — the established consensus among industrial capitalists during the age of Pax Britannica between the downfall of Napoleon and the Franco-Prussian War. Sovereign areas already hospitable to informal empire largely avoided formal rule, even often during the shift to New Imperialism. China , for instance, was not a backward country unable to secure the prerequisite stability and security for western-style commerce, but a highly advanced empire unwilling to admit western (often drug-pushing) commerce, which may explain the West's contentment with informal 'Spheres of Influence'. China, unlike tropical Africa, was a securable market without formal control. The victory of forces of the British East India Company at Plassey (1757) opened the great Indian province of Bengal to British rule, though later (1770) famine exacerbated by massive expropriation of provincial government revenues aroused controversy at home. The nineteenth century saw Company rule extended across India after expelling the Dutch, French and Portuguese. Following the First Indian War of Independence of 1857 India became a crown colony. The territory continued to expand as Ceylon (now Sri Lanka ) and Burma (now Myanmar ) were added to Britain's Asian territories, which extended further east to Malaya and (1841) to Hong Kong following a successful war in defence of the Company's opium exports to China . During the First Industrial Revolution, the industrialist replaced the merchant as the dominant figure in the capitalist system. In the latter decades of the nineteenth century, when the ultimate control and direction of large industry came into the hands of financiers, industrial capitalism gave way to financial capitalism and the corporation. The establishment of behemoth industrial empires, whose assets were controlled and managed by men divorced from production, was a dominant feature of this third phase. New products and services were also introduced which greatly increased international trade. Improvements in steam engine design and the wide availability of cheap steel meant that slow, sailing ships could be replaced with steamships, such as Brunel's SS Great Western. Electricity and chemical industries also moved to the forefront. In many of these sectors Britain had far less of an edge than other powers such as Germany and the United States , who both rose to equal and even surpass Britain in economic heft. Amalgamation of industrial cartels into larger corporations, mergers and alliances of separate firms, and technological advancement (particularly the increased use of electric power and internal combustion engines fuelled by coal and petroleum) were mixed blessings for British business during the late Victorian era. The ensuing development of more intricate and efficient machines along with monopolistic mass production techniques greatly expanded output and lowered production costs. As a result, production often exceeded domestic demand. Among the new conditions, more markedly evident in Britain, the forerunner of Europe's industrial states, were the long-term effects of the severe Long Depression of 1873-1896, which had followed fifteen years of great economic instability. Businesses in practically every industry suffered from lengthy periods of low — and falling — profit rates and price deflation after 1873. Long-term economic trends led Britain, and to a lesser extent, other industrialising nations such as the United States and Germany , to be more receptive to the desires of prospective overseas investment. Through their investments in industry, banks were able to exert a great deal of control over the British economy and politics. Cut-throat competition in the mid-1800s caused the creation of super corporations and conglomerates. Many companies borrowed heavily to achieve the vast sums of money required to take over their rivals, resulting in a new capitalist stage of development. By the 1870s, financial houses in London had achieved an unprecedented level of control over industry. This contributed to increasing concerns among policymakers over the protection of British investments overseas — particularly those in the securities of foreign governments and in foreign-government-backed development activities, such as railways. Although it had been official British policy to support such investments, with the large expansion of these investments in the 1860s, and the economic and political instability of many areas of investment (such as Egypt ), calls upon the government for methodical protection became increasingly pronounced in the years leading up to the Crystal Palace Speech. At the end of the Victorian era, the service sector (banking, insurance and shipping, for example) began to gain prominence at the expense of manufacturing. Foreign trade thus tripled in volume between 1870 and 1914, although (again) most of the activity occurred among the industrialised countries, or between them and their suppliers of primary goods or their new markets. In 1913, only 11 percent of the world's trade took place between primary producers themselves. Britain ranked as the world's largest trading nation in 1860, but by 1913 it had lost ground to both the United States and Germany: British and German exports in that year each totalled $2.3 billion, and those of the United States exceeded $2.4 billion. More significant was the emigration of their goods and capital. As foreign trade increased, so in proportion did the amount of it going outside the Continent. In 1840, £7.7 million of its export and £9.2 million of its import trade was done outside Europe; in 1880 the figures were £38.4 million and £73 million. Europe's economic contacts with the wider world were multiplying, much as Britain's had been doing for years. In many cases, colonial control followed private investment, particularly in raw materials and agriculture. Intercontinental trade between North and South constituted a higher proportion of global trade in this era than in the late 20th century period of globalisation. In a scramble for overseas markets between the Franco-Prussian War and World War, Europe added almost 9 million square miles (23,000,000 km²) — one-fifth of the land area of the globe — to its overseas colonial possessions. Ushering out the cavalier colonialism of the mid-Victorian era, the age of Pax Britannica, the late nineteenth century Romantic Age was an era of "empire for empire's sake". But scholars debate the causes and ramifications of this period of colonialism, dubbed "The New Imperialism" to distinguish it from earlier eras of overseas expansion, such as the mercantilism of the sixteenth to eighteenth centuries or the liberal age of 'free trade' colonialism of the mid-nineteenth century. Continental political developments in the late 19th century, relating to the overall breakdown of the Concert of Europe, also rendered this imperial competition feasible, in spite of Britain 's centuries of long-established naval and maritime superiority. As unification of Germany by the Prussian 'Garrison State' went forward, contending capitalist powers were thus ready to compete with Britain over stakes in overseas markets. The aggressive nationalism of Napoleon III and the relative political stability of France under the liberal Third Republic also rendered France more capable of challenging Britain's global preeminence. Germany, Italy , and France were simply no longer as embroiled in continental concerns and domestic disputes as they were before the Franco-Prussian War. Contemporary world-systems theorist Immanuel Wallerstein perhaps better addresses the counter-arguments to Hobson without degrading his underlying inferences. Wallerstein's conception of imperialism as a part of a general, gradual extension of capital investment from the "center" of the industrial countries to an overseas "periphery" thus coincides with Hobson's. According to Wallerstein, "Mercantilism... became the major tool of [newly industrialising, increasingly competitive] semi-peripheral countries [Germany, France, Italy, Belgium, etc.] seeking to become core countries." Wallerstein hence perceives formal empire as performing a function "analogous to that of the mercantilist drives of the late seventeenth and eighteenth centuries in England and France." The expansion of the Industrial Revolution hence contributed to the emergence of an era of aggressive national rivalry, leading to the late nineteenth century 'scramble for Africa' and formal empire. Hobson's theory is thus useful in explaining the role of over-accumulation in overseas economic and colonial expansionism while Wallerstein perhaps better explains the dynamic of inter-capitalist geopolitical competition. Recent developments made it easier and more appealing for "semi-peripheral" newly industrialised states to challenge Pax Britannica overseas. With the expansion of the Industrial Revolution, Britain could no longer reap the benefits of being the sole modern, industrial nation. Britain by the outbreak of the Franco-Prussian War was no longer the 'workshop of the world', meaning that its finished goods were no longer produced so efficiently and cheaply that they could often undersell comparable, locally manufactured goods in almost any other market. As these other newly industrial powers, the United States, and Japan after the Meiji Restoration began industrialising at a rapid rate, Britain's comparative advantage in trade of any finished good began diminishing. Just as the power of German and North American capitalisms increased, the relative decline of the British capitalist economy began in the last third of the nineteenth century, contributing to a breakdown of Britain's natural superiority in industry and commerce. Britain's share of world trade fell from one-fourth in 1880, one-sixth in 1913, and one-eighth in 1948. Britain was no longer supplying half the needs in manufactured goods of such nations as Germany, France, Belgium , and the United States. Britain was even growing incapable of dominating the markets of India — a crown colony by 1858 that Disraeli would later deem "the brightest jewel of the crown" —, Manchu China , the coasts of Africa, and Latin America. To make matters worse, British manufactures in the staple industries of the Industrial Revolution were beginning to experience real competition abroad. The German textiles and metal industries, for example, had by the beginning of the Franco-Prussian War surpassed those of Britain in organisation and technical efficiency and usurped British manufacturers in the domestic market. By the turn of the century, the German metals and engineering industries would be producing heavily for the free trade market of what was once "workshop of the world" as well. In midst of Britain's relative industrial decline, the fact that invisible financial exports actually kept Britain "out of the red" is somewhat indicative of both Britain's pressure to secure overseas markets in both nominally independent states and colonies and its newly precarious hegemony over overseas markets. For the most part, formal empire has its roots in the breakdown of Pax Britannica. With the rise of industrial capitalism in Germany, North America, and Japan, its finished goods no longer had a comparative or absolute advantage in any other market. Industrialisation progressed dynamically in Germany and the United States especially, allowing them to clearly prevail over the "old" French and English capitalisms. The "neo-mercantilist" practices of newly industrialising states such as Germany, the United States, and Japan cut Britain off from outlets and even created competition for Britain in sales to these 'peripheral' areas. With contending, emerging 'semi-peripheral' capitalist powers once dependent on British industry ready to vie for competing stakes in overseas markets, inter-capitalist competition also took form of protectionism through higher tariffs, further aggravating the push toward overseas markets: in Germany in 1879, and again following 1902: in the United States in 1890; in France in 1892, 1907, and 1910. The only country to escape this trend was Britain, whose essential strength lay precisely in its preeminence on the world market. German, American, and French imperialists, as mentioned, argued that Britain's world power position gave the British unfair advantages on international markets, thus limiting their economic growth. This affected Britain in two ways. First, of course, new interest of the emergent industrial powers in colonial expansion brought them into direct competition with Britain. The expansion of the Second Industrial Revolution and the rise of similar economic practices (such as amalgamation of industry) in Germany and the United States intensified the competition for overseas markets and hence formal colonialism. New Imperialism, as one means of facilitating the inexorable movement of capital from domestic markets to overseas areas, was thus enabled by recent changes in the North Atlantic balance of power, such as the unification of Germany under Prussia and relative political stability under France's Third Republic, but driven by changing economic realities and the spread of industrial capitalism beyond Britain. By the time Benjamin Disraeli ushered in the age of New Imperialism with his watershed Crystal Palace Speech, which was delivered by no mere coincidence after the Franco-Prussian War and during the Long Depression, Britain was no longer the world's sole modern, industrial nation. Pessimists thus inferred that unless Britain acquired secure colonial markets for its industrial products and secure sources of raw materials, the other industrial states would seize them themselves and would precipitate a more rapid decline of British business, power, and standards of living. The prospect of having to compete to remain the forerunner of the world's economies and empires due to recent changes in the global economy and continental balance of power thus left it ripe for Disraeli's Conservative rule in the 1870s, which would usher in an era of extreme national rivalry that would one day culminate in the Great War. In this sense, historian Bernard Porter argues that formal imperialism for Britain was a symptom and an effect of its relative decline in the world, and not of strength. Symbolic overtures, in fact, such as Queen Victoria's grandiose title of "Empress of India", celebrated during Disraeli's second premiership in the 1870s, helped to obscure this fact. Joseph Chamberlain thus argued that formal imperialism was necessary for Britain because of the relative decline of the British share of the world's export trade and the rise of German, American, and French economic competition. As mentioned, the 'Scramble for Africa', rationalised by Rudyard Kipling-style racism and Social Darwinism in predominantly Protestant empires and the paternalistic (but republican and progressive) French-style "mission of civilisation", was attractive to many European statesmen and industrialists who wanted to accelerate the process of securing colonies upon anticipating the prospective need to do so. Their reasoning was that markets might soon become glutted, and that a nation's economic survival depends on its being able to offload its surplus products elsewhere. At a time when the abandonment of free trade limited the European market, some business and government leaders, such as Leopold II and Jules Ferry, concluded that sheltered overseas markets would solve the problems of low prices and over-accumulation of surplus capital caused by shrinking continental markets. Among the new conditions were the short-term effects of the severe economic depression of 1873, which had followed fifteen years of great economic instability. Business after 1873 in practically every industry suffered from lengthy periods of low profit rates and deflation; profits were falling because too much capital were chasing too few markets, especially after the rise of newly industrialising states in export trade with its traditional markets in continental Europe, China, and Latin America. In addition, such surplus capital was often more profitably invested overseas, where cheap labour, limited competition, and abundant raw materials made a greater premium possible. Another inducement to imperialism, of course, arose from the demand for raw materials unavailable in Europe, especially copper, cotton, rubber, tea, and tin, to which European consumers had grown accustomed and European industry had grown dependent. Following the lead of Britain under Disraeli, even the once hesitantly imperialistic Bismarck was eventually brought to realise the value of colonies for securing (in his words) "new markets for German industry, the expansion of trade, and a new field for German, activity, civilisation, and capital". Examples of strategic competition following the passing of the scene of Bismarck, the era's premier diplomat, that would intensify the drive to consolidate existing spheres of influence and grab new colonies, include the Moroccan Crisis of 1905, the Tangier Crisis resulting from Kaiser Wilhelm's recognition of Moroccan independence, and the second Moroccan Crisis, in which Germany sent its navy to Morocco, thereby testing the precarious Anglo-French Entente. The Entente Cordiale, in fact, was a gentlemen's agreement between Britain and France to curtail further German expansion. The Entente Cordiale and the Franco-Russian alliances were also made because of a common interest. The absolutist Central Powers, led by a newly unified, dynamically industrialising Germany, with its expanding navy — doubling in size between the Franco-Prussian War and the Great War — were a strategic threat to the markets of these relatively declining empires that would one day consist of the Great War Allies. British policymakers feared the prospect of another German military victory over France, which could have reasonably resulted in a German take-over of France's formal colonies, a sort of reversal of the actual outcome of the Great War, after which Britain occupied the vast majority of German and Ottoman colonies as "protectorates". This prospect was especially frightening considering that French colonies tended to be closely situated to Britain's; Nigeria, for instance, was surrounded by French territory, India was near French Indochina, and so forth. Until the dismissal of the aging Chancellor Bismarck by the belligerent Kaiser Wilhelm II, the expropriation of vast, unexplored areas of Asia and Africa by emerging imperial powers such as Italy and Germany and more-established empires such as Britain and France was nevertheless relatively orderly. The 1885 Congress of Berlin, initiated by Bismarck to establish international guidelines for the acquisition of African territory, formalised this new phase in the history of Western imperialism. Between the 1870 Franco-Prussian War and the Great War (the age of New Imperialism), Europe added almost 9 million square miles (23,000,000 km²) — one-fifth of the land area of the globe — to its overseas colonial possessions. Since the "Scramble for Africa" was the predominant feature of New Imperialism and formal empire, opponents of Hobson's accumulation theory often point to frequent cases when military and bureaucratic costs of occupation exceeded financial returns. In Africa (exclusive of South Africa) the amount of capital investment by Europeans was relatively small before and after the 1885 Congress of Berlin, and the companies involved in tropical African commerce were small and politically insignificant, exerting only a tiny influence on domestic politics. First, this observation might detract from the pro-imperialist arguments of Leopold II of Belgium, Italian premier Francesco Crispi, and French Republican Jules Ferry, but Hobson argued against imperialism from a slightly different standpoint. He concluded that finance was manipulating events to its own profit, but often against broader national interests. Second, any such statistics only obscure the fact that African formal control of tropical Africa had strategic implications in an era of feasible inter-capitalist competition, particularly for Britain, which was under intense economic and thus political pressure to secure lucrative markets such as India, China, and Latin America. In Britain's case this process of capitalist diffusion had in many regions led it to acquire colonies in the interests of commercial security; France and Germany would later follow suit. For example, although the then inconspicuously moribund Czarist Empire proved to be little threat to Great Britain following its stunning defeat in the 1905 Russo-Japanese War, British Conservatives in particular feared that Russia would continue to usurp Ottoman territory and acquire a port on the Mediterranean or even Constantinople — a long touted goal of orthodox Russia. These fears became especially pronounced following the 1869 completion of the near-by Suez Canal , prompting the official rationale behind British premier Disraeli's purchase of the waterway. The close proximity of the Czar's (territorially) expanding empire in Central Asia to India also terrified Lord Curzon, thus triggering the Afghan Wars. Cecil John Rhodes and Milner also advocated the prospect of a "Cape to Cairo" empire, which would link by rail the extrinsically important canal to the intrinsically mineral and diamond rich South, from a strategic standpoint. Though hampered by German conquest of Tanganyika until the end of the Great War, Rhodes successfully lobbied on behalf of such a sprawling East African empire. Formal colonies were often, in hindsight, strategic outposts to protect large zones of 'investment', such as India, Latin America, and China. Britain, in as sense, continued to adhere to the Cobdenite notion that informal colonialism was preferable — the established consensus among industrial capitalists during the age of Pax Britannica between the downfall of Napoleon and the Franco-Prussian War. What changed since the Disraeli's Crystal Palace Speech was not necessarily a preference for colonialism over informal empire, but the attitude toward formal rule in largely tropical areas once considered too 'backward' for trade. Sovereign areas already hospitable to informal empire largely avoided formal rule during the shift to New Imperialism. China, for instance, was not a backward country unable to secure the prerequisite stability and security for western-style commerce, but a highly advanced empire unwilling to admit western (often drug-pushing) commerce, which may explain the West's contentment with informal 'Spheres of Influences'. China, unlike tropical Africa, was a securable market without formal control. Following the First Opium War (1839-1842), British commerce, and later capital invested by other newly industrialising powers, was securable with a smaller degree of formal control than in Southeast Asia, West Africa, and the Pacific. But in many respects, China was a colony and a large-scale receptacle of Western capital investments. Western powers did intervene military there to quell domestic chaos, such as the horrific Taiping Rebellion (1851-1864) and the anti-imperialist Boxer Rebellion (1901). For example, General Gordon, later the imperialist 'martyr' in the Sudan , is often accredited as having saved the Manchu Dynasty from the Taiping insurrection, after having defeated the Manchu in the Second Opium War (1856-60). Colonialism in India, however, should dissuade sweeping generalisations and over-simplifications regarding the roles of inter-capitalist competition and accumulated surplus in precipitating the era of New Imperialism. Formal empire in India , beginning with the Government of India Act of 1858, was a means of consolidation, reacting to the abortive Sepoy Rebellion in 1857, which was in itself a conservative reaction among Indian traditionalists to the Dalhousie era of liberalisation and consolidation of the subcontinent. Local concerns in particular zones of investment, hence, should be of concern as well. Formal empire in Sub-Saharan Africa, the last vast region of the world largely untouched by "informal imperialism" and "civilisation", was also attractive to Europe's ruling elites for other potential reasons. First, insofar as the "Dark Continent" was agricultural or extractive, and no longer "stagnant" since its integration with the world's interdependent capitalist economy, it required more capital for development that it could provide itself. Second, during a time when in nearly every year since the 1813 liberalisation of trade onward Britain's balance of trade showed a deficit, and a time of shrinking and increasingly protectionist continental markets, Africa offered Britain an open market that would garner it a trade surplus — a market that bought more from the metropole than it sold overall. Britain, like most other industrial countries, had long since begun to run an unfavourable balance of trade (which was increasingly offset, however, by the income from overseas investments). As perhaps the world's first post-industrial nation, financial services became an increasingly more important sector of its economy. Invisible financial exports, as mentioned, kept Britain out of the red, especially capital investments outside Europe, particularly to the developing and open markets in Africa, predominantly white 'settler colonies', the Middle East, the Indian Subcontinent, Southeast Asia, and the South Pacific. Each of Britain's major elites also found some advantages in formal, overseas expansion: mammoth monopolies wanted imperial support to secure overseas investments against competition and domestic political tensions abroad; bureaucrats wanted more occupations, military officers desired promotion, and the traditional but waning landed gentry wanted formal titles. Observing the rise of trade unionism, socialism, and other protest movements during an era of mass society in both Europe and later North America, the elite in particular was able to utilise imperial "jingoism" to co-opt the support of the impoverished industrial working class. Riding the sentiments of the late nineteenth century Romantic Age, imperialism inculcated the masses with 'glorious' neo-aristocratic virtues and helped instil broad, nationalist sentiments. By the time of Queen Victoria's death in 1901, other nations, including the United States and Germany , had developed their own industries; the United Kingdom 's comparative economic advantage had lessened, and the ambitions of its rivals had grown. The losses and destruction of World War I, the depression in its aftermath during the 1930s, and decades of relatively slow growth eroded the United Kingdom's pre-eminent international position of the previous century. The Great Depression hit the nation especially harshly, as it had still not fully recovered from the war. See also the Great Depression in the United Kingdom. In World War II, there was again a great deal of destruction to British infrastructure, and the years after the war also saw Britain lose almost all of its remaining colonies as the empire dissolved. In the 1945 general election, the Labour Party was elected, introducing sweeping reforms of the British economy. Taxes increased, industries were nationalised, and a welfare state with national health, pensions, and social security was created. The next years saw some of the most rapid growth Britain had ever experienced, recovering from the devastation of the Second World War and then expanding rapidly past the previous size of the economy. By the end of the 1960s, this growth began to slow, and by the 1970s Britain entered a long running period of relative economic malaise. This led to the election of Margaret Thatcher, who cut back on the government's role in the economy and weakened the power of the trade unions. The latter decades of the 20th century have seen an increase in service-providers and a drop in industry, combined with privatisation of some sections of the economy. This change has led some to describe this as a 'Third Industrial Revolution', though this term is not widely used. By the turn of the twentieth century, Britain’s economic fortunes were in relative decline. Germany and the United States were becoming the biggest threats in terms of domestic economic production, having vastly superior natural resources compared to Britain. Furthermore, Germany had developed its own policy of imperialism which led to friction with other imperial powers in Europe up to the First World War. Even with the decline, in 1914 London was still the center of international payments, and a large creditor nation, owed money by others. The First World War (1914–1918) saw absolute losses for Britain’s economy. It is estimated that she lost a quarter of her total wealth in fighting the war. Failure to appreciate the damage done to the British economy led to the pursuit of traditional liberal economic policies which plunged the country further into economic dislocation with high unemployment and sluggish growth. By 1926, a General Strike was called by trade unions but it failed, and many of those who had gone on strike were blacklisted, and thus were prevented from working for many years later. In 1929, the Wall St Crash affected Britain resulting in leaving the Gold Standard. Whereas Britain had championed the concept of the free market when it was ascendant in the world economy, it gradually withdrew to adopting Tariff Reform as a measure of protectionism. By the early 1930s, the depression again signaled the economic problems the British economy faced. When the Labour Government collapsed in 1931, it was replaced by a National Government representing all the troubles that had beset the country. Britain was not alone, with equal economic troubles affecting most European countries, most powerfully Germany. In political terms, the economic problems found expression in the rise of radical movements who promised solutions which conventional political parties were no longer able to provide. In Britain this was seen with the rise of the Communist Party of Great Britain (CPGB) and the Fascists under Oswald Mosley. However, their political strength was limited and they never posed any real threat to the conventional political parties in the UK. Britain’s economic problems are cited as a reason for appeasement. Delaying a commitment to war was a means of buying time to divert scarce economic resources into the production of military hardware and armaments. After war broke out between Britain and Germany in September, Britain imposed exchange controls. The British Government also decided to sell its gold reserves and dollar reserves to pay for munitions, raw materials and industrial equipment from American factories. By the third quarter of 1940 the volume of British exports was down 37% compared to 1935. Although the British Government had committed itself to nearly $10,000 millions of orders from America, Britain's gold and dollar reserves were near exhaustion. The American Government decided to prop up Britain as it neared bankruptcy, so on 10 January 1941 they produced a Bill entitled an "Act to promote the defence of the United States" (its number, H.R. 1776, was the year of American independence) which was put before the United States Congress and which was enacted on 11 March 1941. This Act became known as Lend-Lease, whereby America would lend Britain equipment which she would pay for once the war had finished. One month later British gold and dollar reserves had dwindled to their lowest ever point, $12 million. Under this new agreement with the American Government, Britain agreed not to export any articles which contained Lend-Lease material or to export any goods—even if British-made—which were similar to Lend-Lease goods. The American Government sent officials to Britain to police these requirements. By 1944 British exports had gone down to 31% from 1938. Lend-Lease created problems in reviving Britain's exports after the war. After World War II, the British economy had again lost huge amounts of absolute wealth. Its economy was driven entirely for the needs of war and took some time to be reorganised for peaceful production. Anticipating the end of the conflict, the United States had negotiated throughout the war to liberalise post-war trade and the international flow of capital in order to break into markets which had previously been closed to it, including the British Empire's Pound Sterling bloc. This was to be realised through the Atlantic Charter of 1941, through the establishment of the Bretton Woods system in 1944, and through the new economic power that the US was able to exert due to the weakened British economy. Immediately after the war had ended, the USA halted Lend-Lease. This had been fundamental to the sustainability of the British economy during the war and it was expected by the British that it would continue during the period of transition. Instead, the Labour Government under Clement Attlee sent John Maynard Keynes to negotiate a loan, known as the Washington Loan Agreement in December 1945 (see Anglo-American loan). The terms of this were not as favourable as the British had hoped for and included crucially a convertibility clause, in line with the US policy of liberalisation. In this, the USA expected that within two years, the British currency would become fully convertible. This, combined with the fact that the loan wasn't for as much as Keynes had hoped and the 2% interest rate imposed by the Americans, meant that Britain faced an uphill struggle to revive the economy. The winter of 1946–1947 proved to be very harsh curtailing production and leading to shortages of coal which again affected the economy so that by August 1947 when convertibility was due to begin, the economy was not as strong as it needed to be. When the Labour Government enacted convertibility, there was a run on Sterling, meaning that Sterling was being traded in for dollars, seen as the new, more powerful and stable currency in the world. This damaged the British economy and within weeks it was stopped. By 1949, the British pound was over valued and had to be devalued though this is often considered a measure of last resort for Governments. The Labour Governments of 1945–1951 enacted a political programme rooted in collectivism including the nationalisation of industries and state direction of the economy. Both wars had demonstrated the possible benefits of greater state involvement. This underlined the future direction of the post-war economy, and was supported in the main by the Conservatives. However, the initial hopes for nationalisation were not fulfilled and more nuanced understandings of economic management emerged, such as state direction, rather than state ownership. Throughout though, the basis remained the same: applying the economic theories of Keynes and continued state involvement. Two world wars had taken their toll on the Empire. Decolonisation began with Indian independence in 1947. For many countries formerly part of the Empire, they argued that, in effect, they had won their independence by fighting for Britain during the two wars. However, British power was already shown to be weakened as it became impossible to resist the tide of self determination which ensued. What began under the Labour Government of 1945–1951 was continued under the Conservatives from 1951–1964 with the exception of the Suez Crisis of 1956. After Suez, the Conservatives made it a central feature of their foreign policy rhetoric with Harold Macmillan's Wind of Change speech. The loss of Empire and the material losses incurred through two world wars had affected the basis of Britain’s economy. First, its traditional markets were changing as Commonwealth countries made bilateral trade arrangements with local or regional powers. Second, the initial gains Britain made in the world economy were in relative decline as those countries whose infrastructure was seriously damaged by war repaired these and reclaimed a stake in world markets. Third, the British economy changed structure shifting towards a service sector economy from its manufacturing and industrial origins leaving some regions economically depressed. Finally, part of consensus politics meant support of the Welfare State and of a world role for Britain; both of these needed funding through taxes and needed a buoyant economy in order to provide the taxes. As these factors coalesced during the 1960s, the slogan used by Prime Minister Harold Macmillan "(most of) our people have never had it so good" seemed increasingly hollow. The Conservative Government presided over a ‘stop-go’ economy as it tried to prevent inflation spiralling out of control without snuffing out economic growth. Growth continued to struggle, at about only half the rate of that of Germany or France at the same time. The Labour Party under Harold Wilson from 1966–1970 was unable to provide a solution either, and eventually was forced to devalue the Pound again in 1967. Both political parties had come to the conclusion that Britain needed to enter the European Economic Community (EEC) in order to revive its economy. This decision came after establishing a European Free Trade Association (EFTA) with other, non EEC countries since this provided little economic stimulus to Britain’s economy. Levels of trade with the Commonwealth halved in the period 1945–1965 to around 25% while trade with the EEC had doubled during the same period. Charles de Gaulle vetoed the British attempt at membership in both 1963 and 1967. In 1973 the Conservative Prime Minister, Edward Heath, led Britain into the EEC. However, with the decline of Britain’s economy during the 1960s, the trade unions began to strike leading to a complete breakdown with both the Labour Government of Harold Wilson and later with the Conservative Government of Edward Heath (1970–1974). In the early 1970s, the British economy suffered more as strike action by trade unions, plus the effects of the 1973 oil crisis, led to a three day week in 1973-74. In all, over nine million days were lost to strike action under Heath’s Government alone. However, despite a brief period of calm negotiated by the Labour Government of 1974 known as the Social Contract, a break down with the unions occurred again in 1978, leading to the Winter of Discontent, and eventually leading to the end of the Labour Government, then being led by Jim Callaghan. The extreme industrial strife along with rising inflation and unemployment led Britain to be nicknamed as the "sick man of Europe." Also in the 1970s, oil was found in the North Sea , off the coast of Scotland. When Margaret Thatcher became Prime Minister in 1979, her main priorities were to reduce the role of the state in the economy and to reduce the power of the unions and their ability to paralyse the economy, a battle which culminated in the Miners' Strike of 1984. She also applied monetarist policies to reduce inflation, and reduced public spending—these deflationary measures resulted in the 1979-80 recession that led to 100,000 being added to the unemployment register every month. Her rhetoric was of a trimmer civil service and good housekeeping. Major state controlled firms were privatised, including British Aerospace (1981), British Telecom (1984), British Leyland (1984), Rolls-Royce (1987), and British Steel (1988). The electricity, gas and English water industries were split up and sold off. The ultimate success of Thatcher’s approach has been contested, but the political landscape has changed, with the chief opposition to Thatcher's Conservatives, the Labour Party, advocating many of the same economic methods, but with a greater social dimension. Since 1973, the UK has been a member of the European Economic Community (whose members would later form the European Union) and its predecessors. Various British governments have signed on to measures which have been aimed at improving economic conditions, such as the Single European Act (SEA), signed by Margaret Thatcher. This allowed for the free movement of goods within the European Union area. The ostensible benefit of this was to give the spur of competition to the British economy, and increase its ultimate efficiency. Exchange controls, in operation since the war, were abolished in 1979. British net assets abroad rose approximately ninefold from £12 billion at the end of 1979 to nearly £110 billion at the end of 1986, a record post-war level and second only to Japan. Privatisation of nationalised industries increased share ownership in Britain. The proportion of the adult population owning shares went up from 7% in 1979 to 25% in 1989. During much of the 1980s Britain experienced a period of boom, including an unprecedented housing boom. However, the period was also characterised by continued social strife. Unemployment skyrocketed and social ills such as homelessness and absolute poverty, which had been almost entirely eradicated in Britain during the post-war era , became common features of British life again . There was rioting in various inner-city districts,the most serious in Toxteth , Liverpool and Brixton , London in 1981, and Broadwater Farm , Tottenham , London in 1985, violent clashes during the miner's strike, and a wave of civil disobedience culminating in rioting when the Thatcher government introduced, ultimately unsuccessfully, the Poll Tax. It is not clear whether Thatcherism was the only reason for the boom in Britain in the 1980s, as there was also a world wide boom around the same time. However many of the economic policies put in place by the Thatcher governments have been kept since, and the Labour Party which had once been so opposed to the policies had by the late 1990s dropped all opposition to them. In 1990 Margaret Thatcher stood down from the office of Prime Minister after not getting the political support she felt she needed to continue. John Major was elected her successor. The British pound was tied to EU exchange rates, using the Deutsche Mark as a basis, as part of the Exchange Rate Mechanism (ERM); however, this resulted in disaster for Britain. The restrictions imposed by the ERM put pressure on the pound, leading to a run on the currency. Black Wednesday in 1992 ended British membership of the ERM. It also damaged the Conservatives' credibility of economic management, and contributed to the end of the 18 years of consecutive Conservative government in 1997. In 1997, the Labour Party swept to power with a huge majority in the House of Commons . On entering power Tony Blair's Labour Party stuck with the former Conservative government's spending plans. The Chancellor, Gordon Brown, gained a reputation by some as the "prudent Chancellor" and helped to inspire renewed confidence in Labour's ability to manage the economy. One of the first acts that the new Labour government embarked on was to give the power to set interest rates to the Bank of England , effectively ending the use of interest rates as a political tool. Labour also introduced the minimum wage to the United Kingdom , which has been raised from time to time since its introduction. The Blair government also introduced a number of strategies to cut unemployment. Unemployment has fallen back to the level it was in the late 1970s, although it still remains significantly higher than it was during the post-war era and the 1960s. In the Labour Party's second term in office, beginning in 2001, the party increased taxes and borrowing. The government wanted the money to increase spending on public services, notably the National Health Service, which they claimed was suffering from chronic under-funding. A quarterly report prepared by the Economist Intelligence Unit on behalf of Barclays Wealth in 2007 estimated that there were 4,000,000 dollar millionaires in the UK, second only to the USA. Growth rates were consistently been between 2% and 3% from 2000 to early 2008 and inflation levelled off at around 2%. The Bank of England's control of interest rates was a major factor in the stability of the British economy over that period . The pound continued to fluctuate, however, reaching a low against the dollar in 2001 (to a rate of $1.37 per £1), but rising again to a rate of approximately $2 per £1 in 2007. Against the Euro, the pound was steady at a rate of approximately €1.45 per £1. Since then, the effects of the Credit crunch have led to a slowdown of the economy. At the start of November 2008, for example, the pound was worth around €1.26; by the end of the year, it had almost approached parity, dropping at one point below €1.02 and ending the year at €1.04. For further details on Britain’s contemporary economy, see Economy of the United Kingdom. The process will see the BoE creating new money for itself, which it will then use to purchase assets such as government bonds, bank loans, or mortgages. Despite the misconception that quantitative easing involves printing money, the BoE are unlikely to do this and instead the money will be created electronically and thus not actually enter the cash circulation system. The initial amount to be created through this method will be £75 billion, although Chancellor of the Exchequer Alistair Darling had given permission for up to £150 billion to be created if necessary. It is thought the process is likely to occur over a period of three months with results only likely in the long term. The BoE has stated that the decision has been taken to prevent the rate of inflationfalling below the two percent target rate. Mervyn King, the Governor of the BoE, also suggested there were no other monetary options left as interest rates had already been cut to their lowest level ever of 0.5% and it was unlikely they would be cut further. Welcome parliament.uk. Retrieved 15 November, 2008. Ratification: October 1706 - March 1707 parliament.uk. Retrieved 15 November, 2008. Jeffry A. Frieden. "International Investment and Colonial Control: A New Interpretation." International Organization, 48:4 (Autumn, 1994), pp. 559-593. John G. Ruggie. 1982. "International Regimes, Transactions, and Change: Embedded Liberalism in the Postwar Economic Order," International Organization pp. 379-415. Nigel Lawson, The View from No. 11: Memoirs of a Tory Radical (Bantam, 1992), p. 207. Barclays Wealth Insights, Volume 5: Evolving Fortunes, page 7. Barclays Wealth 2008. D. H. Aldcroft and H. W. Richardson, The British Economy, 1870-1939 (1969). B. W. E. Alford, British Economic Performance, 1945-1975 (1988). Michael Ball and David Sunderland. An Economic History of London, 1800-1914 Routledge, 2001. D. K. Fieldhouse, Economics and Empire, 1830-1914 (1973). Sara Horrell; "Living Standards in Britain 1900-2000: Women's Century" National Institute Economic Review 2000, 172:62–77. A. S. Milward, The Economic Effects of the Two World Wars on Britain (1970). G. C. Peden, British Economic and Social Policy: Lloyd George to Margaret Thatcher (1985). Henry Pelling, A History of British Trade Unionism (1963). S. Pollard, Britain's Prime and Britain's Decline: The British Economy, 1870-1914 (1989). S. Pollard, The Development of the British Economy, 1914-1967 (1967). E. Roberts, Women and Work, 1840-1940 (1988). S. B. Saul, The Myth of the Great Depression, 1873-1896 (1969).